UNLESS A GRAIN OF WHEAT FALLS TO THE GROUND AND DIES, IT REMAINS JUST A GRAIN OF WHEAT.. This is our last full week of Lent before we experience the Triduum, Holy Week. 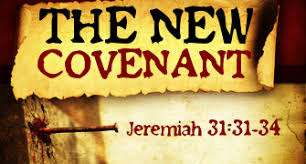 Our readings this week focus on the New Covenant, prophesied by Jeremiah and coming to fulfillment in Jesus. The hour has come! In our first reading (Jeremiah 31:31-34), we hear the beautiful and tender call of God to a new order, a new covenant, a personal covenant, written on our hearts. Unlike the old covenant, which was physical and temporal, this covenant is spiritual and everlasting. It is based on a love relationship with the Father through Jesus Christ. The days are coming, says the LORD, when I will make a new covenant with the house of Israel and the house of Judah. It will not be like the covenant I made with their fathers the day I took them by the hand to lead them forth from the land of Egypt; for they broke my covenant, and I had to show myself their master, says the LORD. But this is the covenant that I will make with the house of Israel after those days, says the LORD. I will place my law within them and write it upon their hearts; I will be their God, and they shall be my people. No longer will they have need to teach their friends and relatives how to know the LORD. All, from least to greatest, shall know me, says the LORD, for I will forgive their evildoing and remember their sin no more. In our Gospel reading (John 12:20-33), we hear of Jesus' very human reaction to the thought of his coming "hour", when he would be lifted up on a cross, hung there to die. It was one of terror. And yet, his trust in his heavenly Father allowed him to proceed with peace in his heart. This is the institution of the New Covenant of which Jeremiah spoke in our first reading. Jesus' "hour has come." Some Greeks who had come to worship at the Passover Feast came to Philip, who was from Bethsaida in Galilee, and asked him, "Sir, we would like to see Jesus." Philip went and told Andrew; then Andrew and Philip went and told Jesus. Jesus answered them, "The hour has come for the Son of Man to be glorified. Amen, amen, I say to you, unless a grain of wheat falls to the ground and dies, it remains just a grain of wheat; but if it dies, it produces much fruit. Whoever loves his life loses it, and whoever hates his life in this world will preserve it for eternal life. Whoever serves me must follow me, and where I am, there also will my servant be. The Father will honor whoever serves me. "I am troubled now. Yet what should I say? 'Father, save me from this hour'? But it was for this purpose that I came to this hour. Father, glorify your name." Then a voice came from heaven, "I have glorified it and will glorify it again." The crowd there heard it and said it was thunder; but others said, "An angel has spoken to him." Jesus answered and said, "This voice did not come for my sake but for yours. Now is the time of judgment on this world; now the ruler of this world will be driven out. And when I am lifted up from the earth, I will draw everyone to myself." He said this indicating the kind of death he would die. In our Epistle reading from the Letter to the Hebrews (5:7-9), the author more fully describes Jesus' very human fear of death as "loud cries and tears". And yet his obedience to the will of the Father was what made him "perfect." In the days when Christ Jesus was in the flesh, he offered prayers and supplications with loud cries and tears to the one who was able to save him from death, and he was heard because of his reverence. Son though he was, he learned obedience from what he suffered; and when he was made perfect, he became the source of eternal salvation for all who obey him. Just as Jesus was transformed through his suffering and death into eternal glory with the Father, so too are we transformed in the Eucharist. In every Mass, we participate in the relived experience of that terrifying night and Jesus' tortuous death on the cross and then glorious resurrection and triumph over the evil one of this world. When we receive his Body and drink his "Blood of the New Covenant", we take into our being the law which is written on our hearts. "I will be their God and they shall be my people." How could we ever miss such an opportunity.